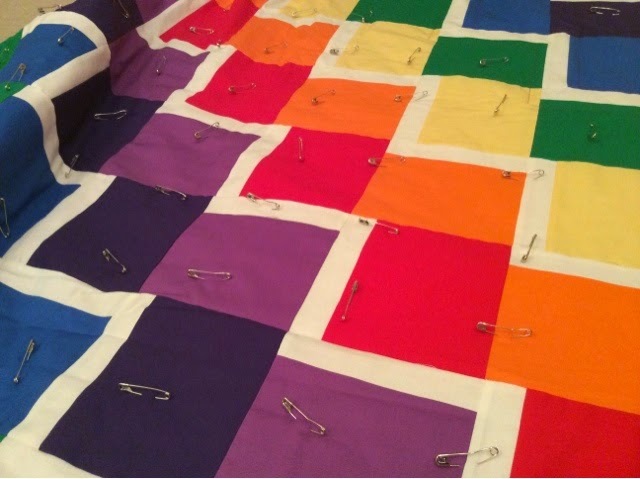 I'm currently working on my rainbow quilt. This one is destined to be a Christmas present, but as it's for my 14 month old son who is unlikely to stumble across this post, I feel safe sharing it. 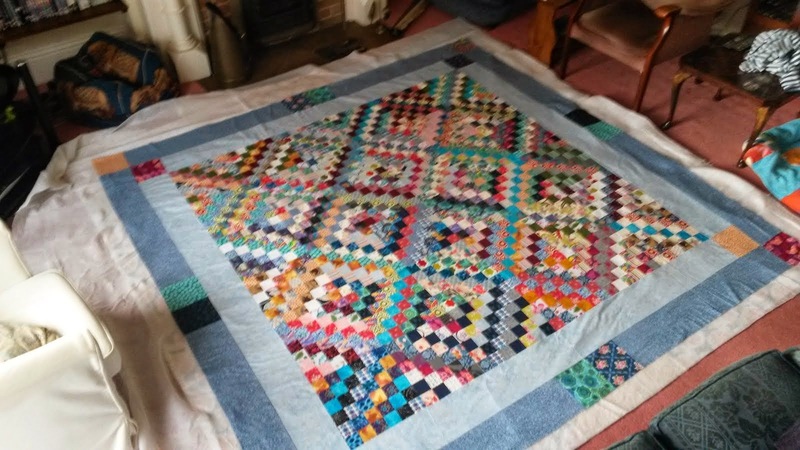 This is the first quilt that I've made using solids, and I've really enjoyed the novelty of the big bold blocks of colour. I used kona solids for the fabric, and they are gorgeous, vibrant colours (when it's finished I will take a photo in the daylight to show the colours off better) and the fabric has a lovely weighty feel. 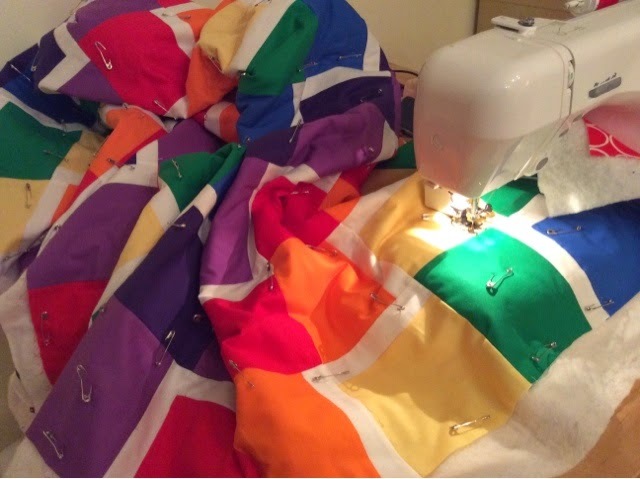 I bought the fabric from plush addict (here) where they do a rainbow fat quarter bundle, which pretty much solved my fabric selection! My original plan was to make each of the zig zag stripes in a single colour, but when I was laying it out it just didn't look right, and after a lot of playing around I combined two colours per zig zag stripe. 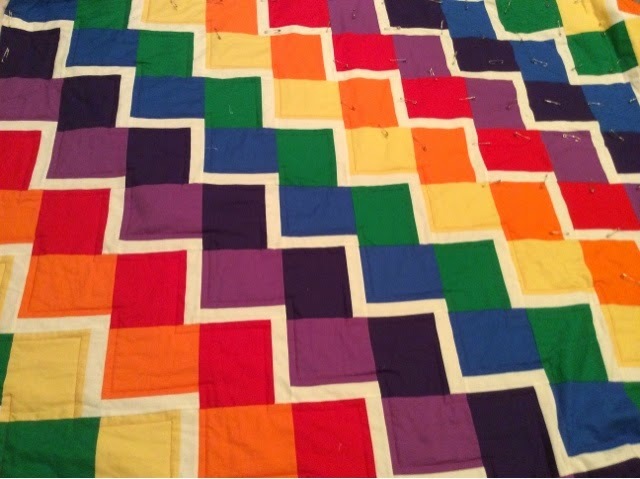 I got the idea for the zig zag stripe layout using two tone blocks from Amanda Jean over at crazymomquilts. It's a neat technique to form zig zags without the need for half square triangles! Each block measures 5.5 inches finished: 4.5 inches of colour and a 1 inch white stripe (the white is kona snow). I'm currently quilting it fairly simply, sewing lines about half an inch away from the white stripes on each side. I'm using red thread for this so that it shows up on most of the squares, a bit like top stitching. I don't tend to quilt very heavily as I like the look of widely spaced lines (and also I'm also a bit impatient and don't want to spend days doing it). I finished piecing this quilt top over the summer, and when I started quilting it tonight I felt incredibly unmotivated. I think the novelty of it had worn off and it just felt like drudge work to get it finished. After I'd been working for a little while though (with the aid of a few episodes of The West Wing), I really started to get into it and I'm falling back in love with the rainbows. I just hope my little man likes it - it will certainly be good for playing hide and seek under!